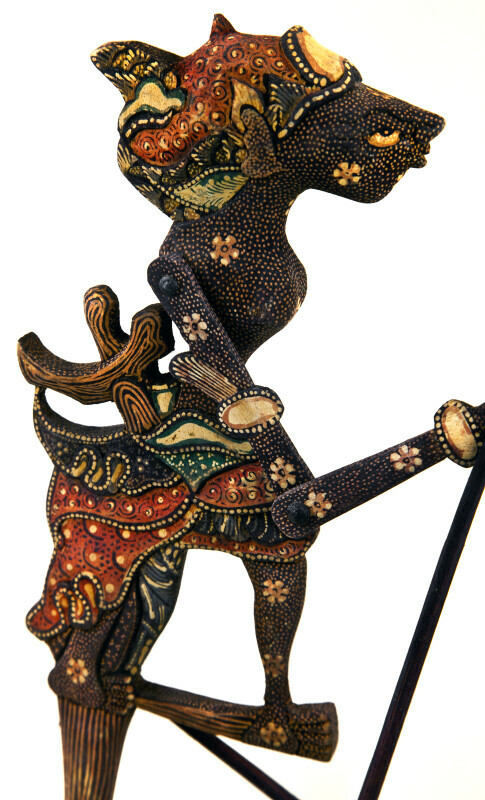 This handcrafted batik wood shadow puppet, also known as wayang klitik (if made with wood) or wayang kulit (if made with leather), originates in Java (an island in Indonesia). It represents a character in the ancient Sanskrit Ramayana epic story of Rama and Sinta. The flat articulated figure is held between a source of light and a screen or wall. Then, when a puppeteer moves the shadow puppet or the light source, the shadow appears to walk, dance, etc. The figure stands 12 inches (30 cm) tall. WARNING: You are about to download a 18.5 MB TIFF!